A review of a phenomenal three days at the Cleaning Show 2019 from the event’s Official Media Partner. C&M takes a look at new products and processes improving cleaning and hygiene standards in critical locations. Jamie Wright, managing director at Incentive QAS, looks backwards – and forwards – at a career in the cleaning industry. the reality of evolution Over 3O yearsâ&#x20AC;&#x2DC; experience in dilution technology culminate in EvoDose. Capable of diluting up to four products with no chemical carry-over, thanks to Hydroâ&#x20AC;&#x2DC;s patented QDV technology, EvoDose offers any combination of high or low flow dispensing for bucket or bottle filling. With a lockable cabinet system, a remote activation gun, bottle activation, AccuPro pressure regulation technology - for accurate and consistent dilution - and a brand new low pressure venturi option, EvoDose really packs a punch. The innovative Puracator system enables access to the entire inner surface of small diameter pipework with no need to dismantle. 5 bar water jets remove debris and growth while dry steam at 100°C removes biofilm & sanitises pipework. Avoid significant costs and inconvenience of replacement pipes. Offers the option of an antimicrobial coating of the entire pipework if required. on page 22 of this issue. 26 March. See you there! Wishing you a happy, clean, tidy and healthy month ahead. industry, we are also losing a wealth of skills and experience. diamond pads just add water! Twister daily cleaning routines as simple as 1, 2, 3. Twister is a revolutionary, daily ďŹ&#x201A;oor cleaning method, completely free from chemicals. Our diamond pads offer simplicity, superior cleaning performance, on time delivery and unbeatable low cost of operations. Do you want better results? Simple. Just add water! 34 Special Report: Cleaning up Jamie Wright, managing director at Incentive QAS, looks back – and forwards – at a career in the cleaning industry. Industry News In the news this month… BICSc launches ‘BICSc Lab’ event, All CHSA distributor members to be accredited by 2020, Critical facilities solutions launches in EMEA, FM market debt to rise by £1 billion in 2019. People Personnel news and new appointments from across the cleaning and FM sectors. Contracts We take a look at all the latest contracts awarded across the industry. Clear Impressions Sponsored feature from Grundon Waste Management. THE OFFICIAL REVIEW OF THE CLEANING SHOW 2019 A review of a phenomenal three days at the Cleaning Show 2019 from the event’s Oﬀicial Media Partner. 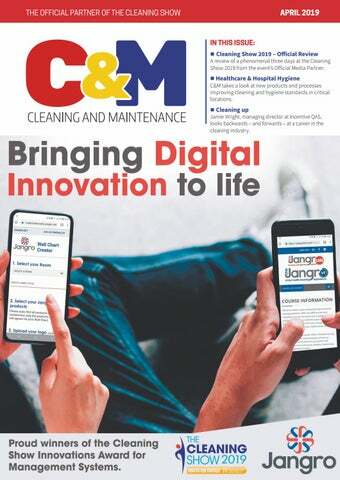 Feature: Healthcare & Hospital Hygiene C&M takes a look at new products and processes improving cleaning and hygiene standards in critical locations. New Products An overview of some of the new products available on the market this month. Looking back at the past month in the cleaning sector. Thinking outside the bottle - why greener cleaning doesn’t need to be complicated. 21 A job worth doing – a contractor’s blog. Lee Andrews reports. board member, as well as keynotes from Citation and Darwin Clayton. especially with Brexit on the horizon. stipulated in the relevant Accreditation Scheme. ‘what’s on the box is what’s in the box’. AT A GLANCE 9The continuous filter system means that the same water can be used for up to a week. 9Save up to 1,000 litres of water a day! 9Enhanced productivity & labour saving in excess of 25%. 9Available either within the ICE R Scrub 85 NSC or as a standalone unit that can be used with any scrubber dryer. Aqua Smart (Non-Stop Cleaning) an innovative system which recycles and filters the water used to clean floors. Please email enquiries@ice-clean.com to request a brochure. 90% on water costs associated with cleaning operations. downward trend forecast for 2019.
celebrating what our people do day in day out. in the outsourced cleaning market. encourage you to enter.” The entry form can be found at: www. Leader of the year; and Rising star award. Hygiene Awards to London for the first time. we’re having with expansion,” added Gill. the south later this year. businesses are having the same struggle. and by recruiting the best possible people. produced during the lifetime of the vehicles. electric vehicles for use throughout Birmingham by its contract managers. From left: Debbie Rhodes, contract manager; David Holmes-McClure, health and safety manager; and Maureen Francis, contract manager - all of We Clean Ltd – with the electric vehicles at Brindleyplace. member companies to be a part of the process. five-year commitment to the programme. Lewis Baron is in his second year of a degree in physiotherapy at the University of Bradford. years even if the degree is four years or longer. almost 20 years of industry experience with him. champion awareness of mental health. UK to appoint a mental health first-aider. qualification in mental health awareness. would have hit the general public. the outcome was a totally unacceptable standard. they contain only some of the information you require. exceptional price, £60 or more per volume. need to eat to live, but we need cleaning to survive! cleaned at home, they can clean anywhere. only those who have been trained can clean correctly. the general public, before it is too late. that one person’s clean is another person’s dirty. contractor at Caldicot School in Monmouthshire. services for a further three years. duty of care to its occupiers and their staff. used in such a situation. environment for both our staff and customers. water safety requirements across the portfolio. Quality not quantity for waste management success Described by some as the ‘Blue Planet eﬀect’, today more and more businesses are aspiring to do better at waste management and recycling. Cleaning companies are often in the front line of helping their clients to achieve those goals and, says Anthony Foxlee-Brown from Grundon Waste Management, there are many opportunities to help make a diﬀerence, as these examples show. recycling, reprocessing and reusing different materials, but the secret is to prioritise quality over quantity and that’s where specialist expertise comes in. It is the quality of waste usually down to good segregation and less contamination - that dictates the end result. And although the ‘swoosh’ recycling logo has become ubiquitous on many items, the reality can be different and it is very hard to keep track of what to do and what not to do. the keynote presentation, which will be delivered by Steve Ashkin. or the bottle’s cosy and cute ‘eco’ branding. regimes: reassess, remove and reduce. and immediate difference to the environment. company uses in their homes. UK in the first place. To enable businesses to maximise the usability and efficiency of their batteries and chargers, ECOBAT Industrial has developed the ECOBAT charger app, which allows the user to connect the charger to any mobile device – android or iPhone – and, through its WiFi capability, remotely adjust voltage, amperage and profile settings to ensure the charging procedure is optimised to its full potential. This innovation provides a genuine added-value service to the customer. As the UK’s largest independent battery sales and service supplier, the success of ECOBAT Industrial has come as a result of listening to the needs of its customers and offering them effective and efficient solutions that provide the answers they require. Through this process, which is applied across all aspects of its business, ECOBAT Industrial is able deliver on its sales, support and innovation ethos. 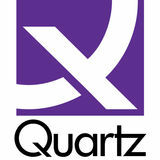 Quartz Business Media, publisher of C&M. 347 international visitors from 45 countries. Steve Ashkin, the ‘Green Cleaning Guru’, presents the opening keynote at the Cleaning Show 2019. USA scoops the prize in the Window Cleaning World Cup Hickey, who is 42 and runs On The Spot Window Cleaning California, was also crowned overall winner in the USA’s Speed Window Cleaning contest held in San Diego earlier this year. Terry ‘Turbo’ Burrows, from Essex, set his first Guinness World Record in 1995 on BBC1’s Record Breakers. He went on to set two more record times in 2005 and in Blackpool in 2009, including the current world record of 9.14 secs. The Swedish champion Jimmy Strom also competed, coming second. Competitors had to clean three consecutive office-style windows set in a frame with a 300mm squeegee and nine litres of water. They Terry ‘Turbo’ Burrows competing in the Window Cleaning World Cup. Jeremiah Hickey, winner of the Window Cleaning World Cup. window cleaning industry’s trade association. The judges of the Window Cleaning World Cup inspect one contestant’s eﬀorts. Douglas Cooke, executive chairman, Principle Cleaning Services Ltd.
MyFresh is the latest Award Winning Innovation from P-WaveÂ® that delivers targeted, clean and efficient air freshening for small, personal spaces. Using a MOTION SENSOR located within the front panel, the high velocity MyFresh fan springs into action exactly when required, reducing fragrance overload and nasal fatigue. Most important of all, the liquid free, DRY FRAGRANCE REFILLS (no sprays, spills or sticky residues) are 100% RECYCLABLE and are offered in FOUR PREMIUM FRAGRANCES! The MyFresh cabinet is LOCKABLE and also features an LCD screen which reminds the washroom attendant when to replace the battery and refill. Whilst the product is perfect for use inside bathroom cubicles or on a vanity mirror, MyFresh isn't just limited to the washroom - the system is also ideal for use in elevators or even on a desk in an office, it's incredibly versatile and really is the perfect air freshener for any small space! Awards during the first afternoon of the show. • Paul Pearce, technical director, NCCA. excellence, destinations and venues, OCS. • Bob Vincent, director, CSSA. • Lynn Webster, director, LWC Ltd.
Service: Arrow County Supplies for SlipStop. Gary Fage, managing director, Janitorial Express. BICSc. • Lilia Lamberto, HR and support services director, Principle Cleaning Services. Suzanne Howe, managing director, Suzanne Howe Communications. Paul Thrupp, director of operational excellence, destinations and venues, OCS. were described as ‘hard to fill’. Stan Atkins, chair of the British Cleaning Council, at the launch of the new report. regional differences, job roles and training. - over twice as much as the UK average. particularly vulnerable to picking up infections. it is even more crucial in the healthcare sector. family member may be harbouring. contaminated buttons on the coffee machine. visitors, and accompanying family members. out particularly frequently and thoroughly. locations for use by staff, patients and visitors. to keep us all safe from other peopleâ&#x20AC;&#x2122;s germs. mobile unit small enough to fit into tight spaces. Thank you for visiting Mirius at The Cleaning Show London Excel 2019 We would like to thank you for taking the time to visit our stand and for allowing our team to show you what Mirius is able to offer your business. We hope you had a great show. Double Awards Honours for Mirius at The Cleaning Show 2019 Mirius is proud to announce we have WON two awards at The Cleaning Show 2019. 1st prize in the Cleaning Product category for our industry 1st 100% Recycled Bottle and then the overall winner in the coveted CSSA London Cleaning Show Award – BEST OF THE BEST – again for our 100% Recycled Bottle. This is one of the highest accolades within the Cleaning & Hygiene industry and we would like to say a huge thank you to everyone who voted for us and the entire Mirius team involved. use or pre-wetted wipes for high-touch areas. convenience, including the new IntelliCare system. also reflects your wider social responsibility. are inclusive to all users. been fun? Absolutely. So how did we do it? turnover and they were crucial to our business. learning the business from the ground up. and/or locations, therefore operating in silos. foundation from which to move forward. on absolutely everything that was out there. buildings and locations, particularly in London. another string to our bow. The imop Lite is the smallest and lightest member of the imop family. With outstanding manoeuvrability and portability, the imop Lite can go in even smaller spaces than its bigger brother, the original imop. From the renewed control panel to the new floating ball water lock, everything is designed to make it even more user friendly. all its hot and cold professional pressure washers. The EASY!Force trigger gun allows users the freedom to master any high-pressured task with effortless control. This innovative trigger gun provides full power with zero force, letting the water do the work. Kärcher has also included a redesign of the lance and high-pressure hose, which features the new trapezoidal EASY!Lock thread. This new lock combines the speed of a quick release coupling with the safety of a threaded connection with only a single turn. GREENTECK Global produces a range of trioxygenpowered units used for degreasing, deodorising and sanitising: from conference hall sized models to single-room units small enough to plug into a domestic electrical socket. viruses, Gojo has launched a new website, www.winter-wellness. Use our Digital Wall Chart Creator to build your own bespoke charts with the products of your choice. Incorporate your own brand by adding your company logo to truly make this â&#x20AC;&#x2DC;your ownâ&#x20AC;&#x2122; useful guide. As well as a copy of the chart, you will receive a full health and safety compliance pack. This comprises of the relevant safety data sheets, product user guides, and COSHH risk assessments of the products that feature on your bespoke chart. Dilute 100ml per 5 litres of warm water (1:50).